Mali, officially the Republic of Mali (French: République du Mali, French pronunciation: ​[maˈli]), is a landlocked country in West Africa. 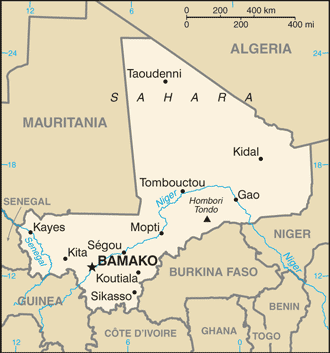 Mali is bordered by Algeria to the north, Niger to the east, Burkina Faso and Côte d'Ivoire to the south, Guinea to the south-west, and Senegal and Mauritania to the west. Its size is just over 1,240,000 square kilometres (480,000 sq mi) with a population of 14.5 million. Its capital is Bamako.